So today's challenge is Clouds. And there was not a cloud in the sky today. When I got home from work I chilled for a bit and then grabbed the camera to get some clouds. And all I saw was blue sky. Today was probably the most beautiful day this year. And after I finish this post I'll be heading out to the patio to hang with hubby and have a beer. I looked and looked for some clouds and finally found the faintest, lightest, feathery wisp of a cloud way off beyond our neighborhood. But I didn't want all the neighborhood crap in the image. LensBaby to the rescue. I bought a LensBaby composer and wide angle optic back in April and have just now started to play with it. Sad, I know. But this great little challenge has inspired me. 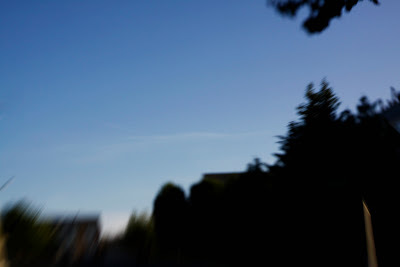 So I grabbed the LensBaby composer and got this shot of the wispy cloud. With the neighborhood blurred out. This challenge has me wanting to take more photos and get creative and play. And in just 3 days. I've never done a challenge before, seen plenty of them, thought about it a bunch of times. But this one caught my eye. So thanks to Caroline at Constantly Evolving whose post I read about the challenge. Love, love, love her work. And thanks to Kimberly at Human Behavior for putting it out there from a link she saw. And she's posting pics from other folks that have joined her for the challenge, like me:) I love how this whole blog, internet thing works! This challenge also has me coming back to the whole purpose of this blog, being present with a photo everyday. And I love that. I'm so glad you've joined in and are being challenged by the challenge. :) It's got my camera in hand more and that's really the point.